Parking - General Information | Registration | Pedestrian and Traffic Regulations | Parking Regulations | Violations and Penalties | Parking Map | Reserved Visitor Parking | Appeals | CarShare | Bicycles, Skateboards, etc. Students, faculty, and staff are expected to park on campus rather than on streets in surrounding neighborhoods. All vehicles and bicycles operating on campus must be registered and renewed every academic school year. 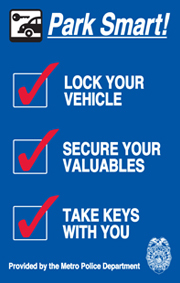 Please reregister your vehicle or bicycle each summer under the Campus Security tab in my.belmont.edu. If you bring a vehicle to campus, you are responsible for observing all parking rules and regulations as well as all federal, state, and local laws governing the operation of a motor vehicle. Belmont University reserves the right to regulate the use of motor vehicles on campus and may prohibit the use of motor vehicles by persons who violate university regulations. Belmont University assumes no financial responsibility for theft or damage to motor vehicles or contents for vehicles parked or operated on campus. Belmont sits in the heart of Nashville and is a convenient walking or biking distance from numerous downtown shops, restaurants, and other amenities. Belmont offers Enterprise CarShare and has secured partnerships with Nashville's Metro Transit Authority (MTA) to provide all students, faculty and staff free transportation on MTA buses and the Music City Star rail system. The University Parking Committee, composed of Student Government and departmental representatives from across campus, is responsible for making recommendations regarding campus traffic and parking; administration considers these recommendations in setting policies and regulations. Rules and regulations apply on all campus property, which includes the section of Belmont Boulevard between Portland Avenue and Acklen Avenue.